Clarets closing in on summer target? Burnley are hopeful of completing a deal for Everton winger Aaron Lennon. But reports suggesting a fee has been agreed are premature. The 30-year-old winger was close to moving to Turf Moor back in August, before opting to stay at Goodison Park, but has dropped down the pecking order after the signing of Theo Walcott. 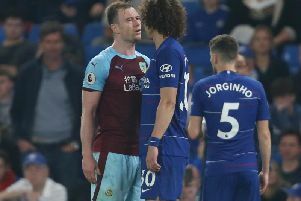 Burnley were looking for another wide player in the summer, before Robbie Brady suffered a knee injury which forced him out for the rest of the season in December. Boss Sean Dyche has since brought in Georges-Kevin Nkoudou on loan from Spurs for the rest of the campaign. The former Leeds United and Spurs wideman Lennon has 21 caps for England. Talks will continue over the weekend, with, potentially, a medical on Monday, though there is a long way to go to get the deal over the line yet. Burnley’s next game after tomorrow’s home clash with Manchester United is not until January 31st - transfer deadline day - at Newcastle United, where Lennon would be in line for a debut if a deal is concluded in the intervening period.